Why - after almost half a century - there is finally an American edition of Karlheinz Deschners masterpiece God and the Fascists (Prometheus Books)? Because it is very timely; because it is in danger, quite unjustly, of falling into oblivion; and because it disrupts the process of suppression, indeed the deliberate policy of disinformation, pursued by the Vatican. It reminds us of the Vatican's collaboration not only with Hitler, probably the greatest criminal of all time, but also with Mussolini, Franco and with the less well-known Pavelic, the fascist leader in Croatia who, together with Cardinal Stepinac, was responsible for the concentration-camp and extermination-centre at Jasenovac, about which, even today, very few people know anything. And there are other reasons for republishing Deschner's book: the Vatican's tissue of lies has been exposed, because the Vatican has, for many decades, tried to present itself as a resistance movement against Hitler and his gang, even though, in the words of Cardinal Faulhaber of Munich, Pope Pius XII "had been the best friend, at the beginning indeed the only friend, of the new Reich". And that was in the early and rather shaky phase of National Socialism, when history could have taken a completely different course! 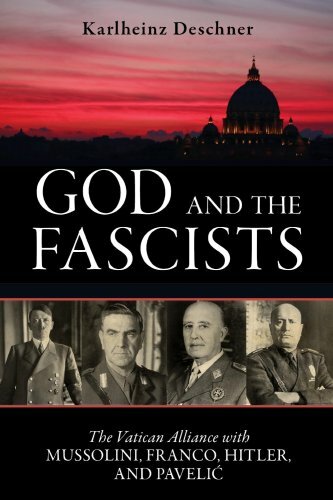 The value of God and the Fascists is precisely that it is not a fashionable book; it does not obligingly serve a current trend of opinion, but presents and summarises precise and detailed historical facts, and draws conclusions from them that everyone can follow. The historian Daniel J. Goldhagen clearly thought it unnecessary to quote Deschner in his book A Moral Reckoning: the role of the Catholic Church in the Holocaust, and its unfulfilled duty of repair, although Deschner had succeeded, 40 years earlier, in giving a fuller account and at the cost of much less ink. Furthermore, Deschner's book, while it has all the excitement of a novel in which every word is true, leaves the reader substantially wiser and more enlightened than before; and no doubt shocked, too, at the extent of the collaboration between the Vatican, Nazism and Fascism! To sum up, Deschner exposed a historical untruth - that of Catholic resistance. Let us not forget that it was the French Revolution that put the Catholic Church in its place and thus put an end to its medieval might - though, alas, only in a very half-hearted way. After all, it was not until 26th July 1826 that the Spanish Inquisition condemned the last heretic - a schoolteacher named Caetano Ripol - to death on the gallows, and his body to "symbolic burning"- almost half a century after the storming of the Bastille! The Papal State which had emerged from bloody wars and had been legitimised by a forged document - the so-called "Donation of Constantine" - was, after 1789, occupied by Napoleon's troops, who arrested Pope Pius VII and took him as a prisoner to Valence in France. However, in 1815 the Congress of Vienna reinstated the Vatican, though with its territories much reduced. Only in 1870, after occupation by Garibaldi's forces, was the Vatican finally absorbed into the newly created Italian nation, whereupon those responsible were excommunicated. And could not have cared less. In the second half of the 19th century, the rise of the bourgeoisie, the growth of European nation-states, the emancipation movement, and faith in progress through improved technology, all combined to force Catholicism on to the defensive. With the First Vatican Council, the Church attempted desperately - and vainly - to do battle with "modern rationalism" and to revive the weakened authority of the Pope through the dogma of papal infallibility. But the tide of the age was running against Catholicism. Under Bismarck's chancellorship in Germany the Kulturkampf, or Battle of the Cultures, saw nearly 2,000 Catholic clerics imprisoned or fined heavily for involving themselves in government matters. On 28 February 1867 the USA broke off diplomatic relations with the Vatican (and did not re-establish them until the presidency of Ronald Reagan in 1984). The "Roman Question" had arisen: how could the Holy See be saved from ultimate, and at that time forseeable, destruction. How, and with whose aid, could its former power be restored? That is the starting-point of Karheinz Deschner's book, God and the Fascists. The purpose of this new edition in the USA is to ensure that it is not consigned to oblivion. In it can be found detailed, historically sound evidence, backed by numerous listed sources, to show that after the First World War the Papacy seized the opportunity to join forces with advancing Fascism and turn back the wheel of history. Out of fear that the workers' movement would triumph throughout Europe - following the Soviet example - the Vatican entered into a pact with the reactionary property-owning classes, and their Fascist hit-men, which would secure the future of both parties. This unholy Catholic alliance with the "lesser (i.e.fascist) of two evils" led to the greatest catastrophe in human history: the Second World War and the Holocaust. Pius XI, by sidelining Italy's Catholic party, the Partito Popolare, opened the way for Benito Mussolini and Italian Fascism. As his reward, the Vatican state was restored to him - under the Lateran Treaties. It was once again a sovereign state, albeit with much smaller territory than originally, but with vast assets of a billion lire in government bonds and 750 million lire in cash. This wealth formed the basis of the Vatican bank, which today, due to its dubious dealings, the suspicion of money-laundering, and its closeness to the Mafia, is under close observation by the US regulatory authorities. It was on exactly this pattern, and under the same premises, that the Vatican helped the Nazis to come to power. In Germany, the Catholic Centre Party (Zentrum) - Europe's oldest political party - was chaired by Prelate Kaas, a close friend of Cardinal Secretary of State Eugenio Pacelli , who was then the second man after the pope in the Catholic hierachy. The Centre Party gave its consent to the Enabling Act of 24th March 1933 and then dissolved itself. This act abolished the Weimar Republic and ushered in the dictatorship of Adolf Hitler. It was the trigger for a series of increasingly disastrous events. The lie of historians, who claim that no one then knew what kind of man they were dealing with, is decisively refuted by Karlheinz Deschner. For even before the first concentration-camps had been built - not for the Jewish population but for political opponents - basic civil rights had been abolished and a boycott of Jewish shops, doctors and lawyers had been called for. The political beliefs and programme which Hitler set out in Mein Kampf, cannot have been unknown to Eugenio Pacelli, the same Pacelli who had until 1929 been the Papal Nunzio in Berlin ("the best-informed diplomat in Germany") and who went on to make his career in the Vatican, first as Cardinal Secretary of State and then, from 1939 to 1958, as Pope Pius XII. This man, enjoying a reputation as an outstanding expert on, and friend of, Germany, garnered the fruits of that collaboration to a huge extent on 20th July 1933 through the Vatican's Concordat with Nazi Germany. This treaty under international law ranks to this day as part of Germany's constitution (Article 123.2). It established the friendly relations between the Holy See and the new German Reich; it introduced religious instruction by the state, on an equal footing with other school subjects; it guaranteed the payment of salaries of religious teachers, up to the rank of bishop, from state taxation, and made sure that the church tax (Kirchensteuer) wascollected by state tax authorities, which was an innovation with far-reaching consequences. Employees were required to make a public declaration of their religious faith in their tax return and lost their previous constitutional right of silence, and employers were compelled to collect the church impost. A Church State was born! Thanks to the Concordat with Hitler, the vestments of the priests enjoyed the same protection as a military uniform, though priests were already released pre-emptively from military service. Naturally, everyone knew what the plan was. The dissolution of the Centre Party was retrospectively justified and a great deal more. Deschner describes how the collaboration of the German episcopacy with the Nazis - which could only occur with the consent of the Curia - continued until the end of the Second World War, and how prayers for Hitler's Reich were offered up every Sunday by priests and bishops right across the country. That too was stipulated in the Concordat (Article 30). How enthusiasm for the war was stirred up, and how on Hitler's birthday churches and cathedrals were decorated with swastikas. Indeed, the papal nuncio, filled with pride, personally congratulated the Führer on 20th april 1939 his 50th birthday - a good six months after the vicious, state-sponsored pogrom known as Reichskristallnacht! In the Kirchenkampf, or Battle of the Churches, which was blown up to be an expression of ecclesiastical resistance, the churches only ever fought for their own narrow interests, never against Hitler, never against the war and at no time on behalf of the Jewish population. Even after the military defeat of Nazi Germany, the Vatican assisted senior Nazi functionaries to flee to South America; it was via this "rat-line" that Mengele and Eichmann evaded Allied justice. What did Pius XII want? What did Benedict XV, Pius XI and Pius XII dream of? They dreamt of a Catholic continental Europe in a united military battle against the godless Soviet Union, as degenerated as it may already have been by Stalin's influence (read Arno Lustigers "Stalin and the Jews: The Red Book"). They dreamt of the end of Orthodoxy, the end of communism and the Catholicisation of Russia. And of a neutral, Anglican Great Britain and a neutral USA. Because a military conflict within the western camp made the outcome of the war unpredictable. After the military defeat of France this dream seemed to be well within reach and in 1940 the whole world was convinced that Hitler would win the war. The realisation of the curia's dream had, with Hitler's help, come within their grasp. We learn from Karlheinz Deschner how the invasion of the Soviet Union on 22 June 1941 was openly welcomed, and not only by the German episcopate, and how unlimited their enthusiasm for Hitler and agitations against Russia were. And Pius XII - who allegedly did too little against Hitler and said too little - spoke in a radio address one week later of "rays of light that raise the heart to great, holy expectations: great bravery and courage in defending the foundations of Christian culture and optimistic hope for their triumph", by which he intended to express, according to Embassy Counsellor Menshausen, the hope that the great sacrifices demanded by this war would not be in vain and would, should Providence so wish, lead to victory over Bolshevism. In this "war between world views", which had been so longed for by the Catholics and which Hitler also called it, the Holocaust was viewed as a kind of collateral damage. There may even have been a secret feeling of satisfaction in light of the 2000 years of Christian anti-Judaism. Had Hitler not, in April 1933, already coquetted before high Catholic functionaries - as Deschner reports - and much to their delight, that his "treatment of the Jewish Question" was merely a continuation of mediaeval Catholic tradition?! In any case, the Pope never condemned the Nazi pogroms against the Jews, not even when the Jews were rounded up before his eyes, so to speak, and taken away. Today's propagated idea of a Judaeo-Christian Occident is based on a syncretism swindle. Karlheinz Deschner reveals how clergy had been taught Russian and other Slavonic languages and clerics trained for missionary activity in the Soviet Union at a special seminar for priests, the Collegium Russicum. A special agreement was made between the Vatican and Hitler's government regarding this. Because of a cooperation between the Jesuits and the SS and Gestapo, the General of the Jesuits, Graf Ledochowski, had already met with representatives of the German secret service in 1940. As early as one year before Hitler's invasion of Russia, Jesuit graduates of the Collegium Russicum crossed the Soviet border in disguise and using false names in order to carry out espionage activities on orders of the Vatican. In a circular from the Wehrmacht High Command in August 1941, it says that the Vatican intended to send as many priests as possible to the occupied territories of Russia in order to prepare the ground for further-reaching plans of Vatican policy and instructed all commanders-in-chief to facilitate this missionary activity of Catholic priests. There are further shocking details to be read in Edmond Paris's Secret History of the Jesuits. In Croatia the Vatican was even more deeply involved in fascist crimes, where the Franciscans played a leading role in the atrocities perpetrated there, which were so brutal that even the Germans complained. The leader of the Croatian fascists, the Ustasa, Ante Pavelic, coined the slogan that a third of the Orthodox population of Yugoslavia should be forcibly converted, a third expelled and the other third murdered. 750,000 Serbs fell victim to this regime with clerical help, and often after brutal torture, as did 80% of the Jews in Yugoslavia. Deschner reminds us about the the concentration-camp and death-factory at Jasenovac, the history of which was later written by the President of the Russell Tribunal, Vladimir Dedijer (The Yugoslav Auschwitz and the Vatican, Prometheus Books, Buffalo NY, 1992). The Primate of the Croatian Catholics, Archbishop Dr Stepinac, collaborated with Pavelic from the first minute to the last. After his conviction as a war criminal, the Ustasa leader managed to escape, initially to South America, with the help of the ratline. He was accompanied by the former contact man between the Croatian archbishop Stepinac and the Vatican, the priest Krunoslav Draganovic, who was, amongst other things, responsible for the deportation of Jews and Serbs during the war as a "resettlement officer" and was later one of the key figures in the organisation of the ratline. He later fled to Franco's Spain, where he found refuge in a Franciscan monastery in Madrid. This war criminal died in 1959 and received the blessing of the Holy Father on his deathbed. Stepinac was the only high cleric who was at least partly brought to justice for his deeds. The sentence: 16 years imprisonment with forced labour. After six years of imprisonment he was released early. Today's theologians may claim that this verdict was based on a "misunderstanding". But it is no misunderstanding that Yad Vashem rejected the obscenity of an application to grant him the title and honour of a "Righteous Among the Nations" twice, in 1970 and 1994. He was beatified by John Paul II in 1998. Another theme of this book is the support of Franco by the Vatican in the Spanish Civil War - and before it. In his résumé at the end of the book, Karlheinz Deschner says, in 1965: "If one considers the attitude of Eugenio Pacelli to the politics of Mussolini, Franco, Hitler and Pavelic, it hardly seems an exaggeration to say: Pius XII is probably more incriminated than any other Pope has been for centuries. He is so obviously involved in the most hideous atrocities of the fascist era, and therefore of history itself, both directly and indirectly, that it would not be surprising, given the tactics of the Roman Church, if he were to be canonized." And now the beatification is already under way, less than fifty years later! If Hitler had won the war - one may wish to add - then he would presumably have long since attained the same Catholic honours. Karlheinz Deschner's book is an important piece of clarification, a jewel for anyone who seeks historical truth; it is an antidote to the historical lie of Catholic resistance against Hitler, and provides a fundamental contribution to the current debate about the papal rehabilitation of Richard Williamson who denied the Holocaust, the planned beatification of Pius XII, the scandal over the Vatican Bank, the reintroduction of the Good Friday Intercession and, in general, the role of the Vatican in the world. One only has to compare this close interrelationship between Church and State, this still surviving German church state - which under the Weimar and Federal constitutions should never have been permitted - with the constitutions of France and the USA, in which the separation of Church and State is clearly stipulated. Then it becomes clear how far today's Germany is from being a modern democracy. It is a country in which the churches, thanks to federal state Concordats, are represented on the boards of every radio and TV channel, and on nearly every newspaper editorial board, and in countless lesser organs of dissemination; and where, sometimes quite openly, sometimes well hidden, they have their hands on the levers of power. Then it becomes clear what great favours Hitler and Mussolini did with their particular answer to the "Roman Question", by restoring to the Vatican its statehood, its wealth and its public influence, all of which were dwindling in the second half of the 19th century. And at what a high cost to the rest of the world! The "Roman Question" must be posed anew. But this time from the other side, the side of reason. The question of how the statehood and sovereignty of the Vatican is justifiable - this far too influential structure is certainly no democracy. We must question the principle on which it intervenes in the affairs of other countries, of Concordats, of state-funded religious teaching by state-salaried teachers, and of the levying of the church tax by the State tax authorities.The question about the long overdue separation of Church and State must be asked wherever this crucial criterion of a modern democracy is not yet fulfilled, where this litmus-test shows a negative result. We must question the legitimacy of a state within a state, with its own judiciary - this Catholic parallel society! If a bishop violates a law, he is - as has so often happened in Europe - shunted off to a monastery. They are far less timid in the United States, where eight dioceses have already been bankrupted as a result of claims for damages arising from charges of abuse. This would be unthinkable in "good old" Europe. Up to now anyway. Anyone seeking Ariadne's Thread, to lead them out of the labyrinth of ecclesiastical control, cannot avoid reading Karlheinz Deschner's book, God and the Fascists. To those who want to dig deeper down through the layers of history, and learn more about the historical origins of Christianity, for example, I recommend Hyam Maccoby's excellent, seminal work, The Mythmaker - Paul and the Invention of Christianity, (Barnes & Noble, New York, 1986), in which he shows that Christianity is not traceable back to the Jewish Jesus, but to the Greek Paul, who concocted a highly virulent blend of Gnosticism, ancient mystery cults and the life-story of Jesus, thus setting in train 2,000 years of Christian anti-Judaism, which culminated in the Holocaust. (As early as April 1933, Hitler was flirting with leading Catholic officials and telling them, to their great delight - as Deschner relates - that his "handling of the Jewish question" was merely a continuation of medieval Catholic tradition). The other Thread of Ariadne that leads out of the religious labyrinth is the subjective, "psychological" one. This can be found by anyone who reads Sigmund Freud (Totem and Taboo, The Future of an Illusion, or Moses and Monotheism), and more especially the pioneering study of religion by Fritz Erik Hoevels, 'Bhagwan' Rajneesh and the Dilemma of any Humane Religion (in "Mass Neurosis Religion", Ahriman International). Both authors make it clear how narrow is the eye of the needle through which human society must pass, if the goals of enlightenment, reason, liberty, equality and the greatest happiness of the greatest number, are to become a reality, and how many archaic, yet very real power structures must first be overcome and broken down. This masterpiece by the famous European Church critic Karlheinz Deschner was first published in the Federal Republic of Germany nearly fifty years ago. One year ago it was republished in Germany at Ahriman Verlag and since October 2013 Prometheus Books in NY is the first American Publishing House to make Deschner known to the US public and to edit God and the Fascists in English. It is very timely, thrillingly written, and a literary achievement of the first rank. But now I don't want no longer to hold back the critical reader to convince himself from the relevance and actuality of this book after almost fifty years after the first edition of God and the Fascists in the Federal Republic. It is a fascinating read, and a high-ranking pleasure at the same time, after which one is much wiser then before. I hope that I have been able to arouse your curiosity. This has been adapted from the Preface to Deschner's English language work "God and the Fascists" published by Prometheus Books ISBN number [978-1-61614-837-9] $21.95. Permission has been granted by the publisher.